WASHINGTON (Reuters) – U.S. home resales surged to a 5-1/2-year high in May as first-time buyers stepped into the market, the latest indication that housing and overall economic activity were gathering steam in the second quarter. The strengthening economic outlook likely keeps the Federal Reserve on course to raise interest rates later this year. The National Association of Realtors said on Monday existing home sales increased 5.1 percent to an annual rate of 5.35 million units, the highest level since November 2009. That put sales this year on track for their strongest gain since 2007. “It suggests that the U.S. housing market recovery is back on track after the missteps earlier this year. We expect this upbeat tone in the housing recovery to continue as the favorable domestic fundamentals begin to reassert themselves,” said Millan Mulraine, deputy chief economist at TD Securities in New York. (Time Magazine) – New U.S. single-family home sales increased in May to a more than seven-year high, further brightening the outlook for the housing market and the broader economy. The Commerce Department said on Tuesday sales rose 2.2% to a seasonally adjusted annual rate of 546,000 units, the highest level since February 2008. April’s sales pace was revised up to 534,000 units from the previously reported 517,000 units. Economists polled by Reuters had forecast new home sales, which account for 9.3% of the market, rising to a 525,000-unit pace last month. Both buyers and sellers are viewing this trend with alarm. Buyers are terrified of being priced out of the market, so they’re stepping up and finally making offers. Sellers, meanwhile, are seeing previously-qualified buyers disappear in droves as higher rates raise the effective cost of home ownership. And realtors, you can bet, are working both sides of the market to fan these fears. The result: sudden, widespread anxiety and lots of new contracts being signed. This, of course, is a temporary situation. If rates go up from here, millions of first-time buyers (most of whom have student loans and/or are working as bartenders, waiters, or corporate temps and are therefore not mortgage-worthy at higher interest rates) will disappear. 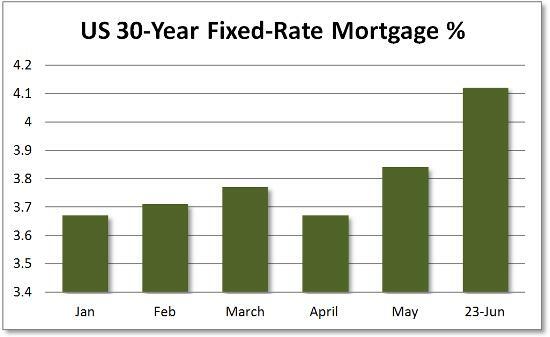 If rates stabilize here, the current sales spike will turn out to have been cannibalized from future demand, and a slowdown will ensue. So the only way for housing to sustainably take off from here is for rates to plunge back to January levels — which would imply serious trouble elsewhere in the economy.